Motherland Farmers washing station and the village Kamiro, seen from the opposite hillside. Motherland Farmers consists of a washing station at one location, next to Kamiro village, and very close by we have a farm with a total of 100 hectares, where 60 hectares will eventually be planted with coffee. We will also have cows and chickens for compost, and macadamia nuts for a secondary income. At the washing station we are also buying cherries from the surrounding smallholders. There are about 1000 farmers in the local community that we are supporting with fertilizer and training for a sustainable and more profitable coffee production. Motherland Farmers is the name of the parent company, which owns a farm and the washing station. Kamiro is the name of the local village, so for now the coffee consists of cherries purchased from the surrounding farmers, and will be sold and branded as Kamiro. In this post we will briefly try to give you an introduction to the project, but in a series of articles also try to share what it takes to start this operation from scratch and some of the experiences we have had so far as producers. You can read more about the whole story and concept of Motherland Farmers here: www.motherlandfarmers.no. The production this year is mainly based on cherry purchase from local smallholder farmers as the Motherland Farmers farm at this point has a very low yield. The harvest is over and we bought about 140 tons of cherries. For Motherland this equals to a little less than 12 tons of the A-grades that Nordic Approach is offering. We have very high requirements on separation, sorting and quality control. Overview of the washing station. Penagos pulper, fermentation tanks, grading channel, and drying beds. Motherland Farmers goal is to produce the best coffee coming out of Rwanda, and to change the financial situation for the people in one of the very poor regions in Rwanda. The consequence of the terrible genocide in Rwanda in 1994 lead to the soil being unattended and abandoned. Even if overall coffee production at this time was not huge, soil revitalization has been important to grow coffee production from 1994 until today. 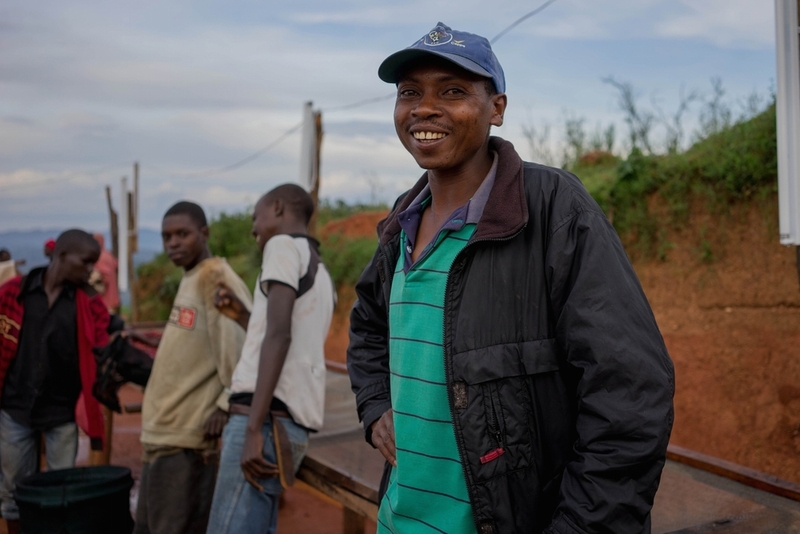 A key element for Motherland Farmers is sustainable business for both the company and the society in general, where upon this poor region of Rwanda will benefit from the coffee business activities. Producing premium coffee by farmers can be achieved, still requires proper training and management. To facilitate best practices in coffee farming, Motherland Farmers has already trained 1900 famers, and is in the process of training 1000 farmers more during their 1 ½ years Farmer Training Program. This program is assisting all farmers and the local society in the reconciliation process..
Nora Hindar has been heading the company since start up as the CEO. By establishing a small investment company among friends for the project, funding for start up was obtained. Nora then contacted us to get professional advice. The result of our cooperation has allowed us to be responsible for the quality assurance program at the coffee washing station, where we are hands-on during the high season. We all got along really well from day one, and were totally on the same page regarding ambitions and quality. About a year later, in 2013, we established the formal partnership and during the same period we bought the extra land close to a water source to establish the washing station. We have the clear goal to produce Rwanda’s best coffees, trying to push the limits of what’s been done so far in the Rwandan coffee history. The goal is to experiment at all levels and stages of the process to take quality forward and set a new standard for what’s achievable in Rwanda. The local community being involved in the construction of the washing station. Spring 2013. Motherland Farmers is located in the Nyamagabe district in the Nyaruziza sector close to the village called Kamiro. The altitude where the farm is located is about 1750 MASL and the washing station is at 1820 MASL. The majority of the coffee both from the farm and the small holders is harvested from 1700 up to 2000 MASL. Motherland Farmers is the name of the parent company having both the farm and the wet mill. They are located relatively close to each other, but are still managed as two separate operations. 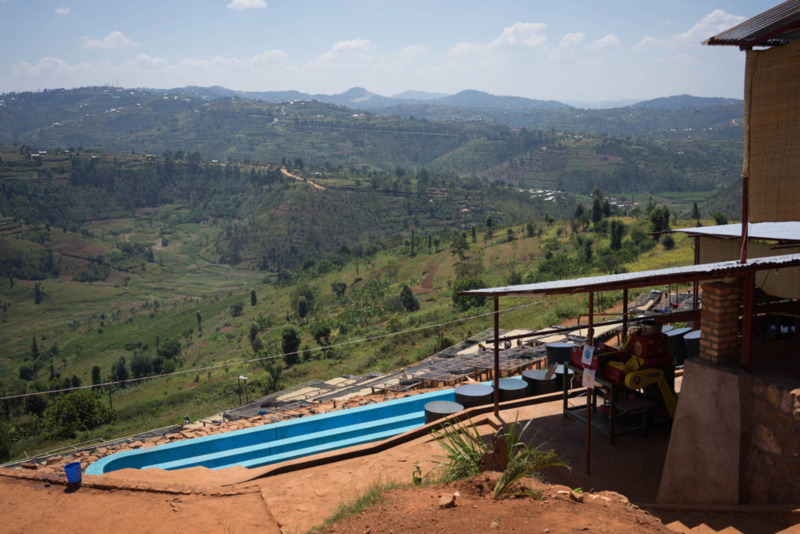 That said, all the coffee from both the farm and the surrounding small holders are processed at the washing station. Motherland Farmers is located in the Nyamagabe district in the Nyaruziza sector close to the village called Kamiro. Nearest city is Butare. The concept is to give as much as we can back to the local community as we believe this will give us access to better coffees, while also increasing the average income for the farmers. Through several organizations we have managed to raise funds and already start holding a lot of farmer trainings on agricultural practices, plant treatment, correct selection on picking, etc. to maximize quality and income. A typical farmer in the area has one or two hundred coffee trees each. By training they can potentially increase their yield from 1 kg of coffee cherries to 5 kgs of cherries per tree. We are also giving the 1000 households 2 Macadamia trees each for additional income. This is all still in the early phases and we are sure both Motherland Farmers and the farmers will see great results in the years to come as the training will continue. Jobs for hundreds of locals in the area at our farm and at our wet mill. 12,000 people will gain from the Motherland Farmer initiative. One of the local farmers delivering cherries to Motherland Farmers. The coffees and products produced at MLF will all be branded differently depending on flavor profile, where the cherries come from, and in the future also by the process, grading, and other improvements we make at the mill. We are still to determine exactly how to separate the coffees by area, how to give names, and how to establish brands. During this first year we are mainly producing two grades from the local surroundings. This is just the beginning — we are already figuring out the strategy for next season based on our experience this year. One thing is certain: the potential is huge — from day one we managed to produce truly high qualities with very distinct flavor profiles. We are cupping every single lot coming from the washing station. The goal is to work on three different quality levels. Unique top lots of rare quality. These will be microlots of limited volumes, 5 – 20 bags per lot. 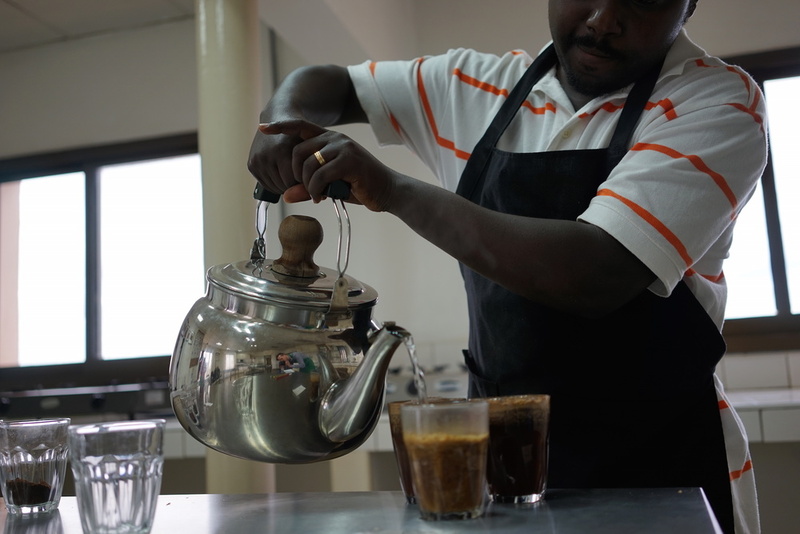 The goal is to take Rwandan coffee to a higher level. Great coffees with unique flavor attributes, both medium-sized lots (40+ bags) for import by Nordic Approach, and potential direct shipment to medium/large roasters and importers looking for traceable quality coffees. Good quality fully washed coffees for direct export to roasters and importers. 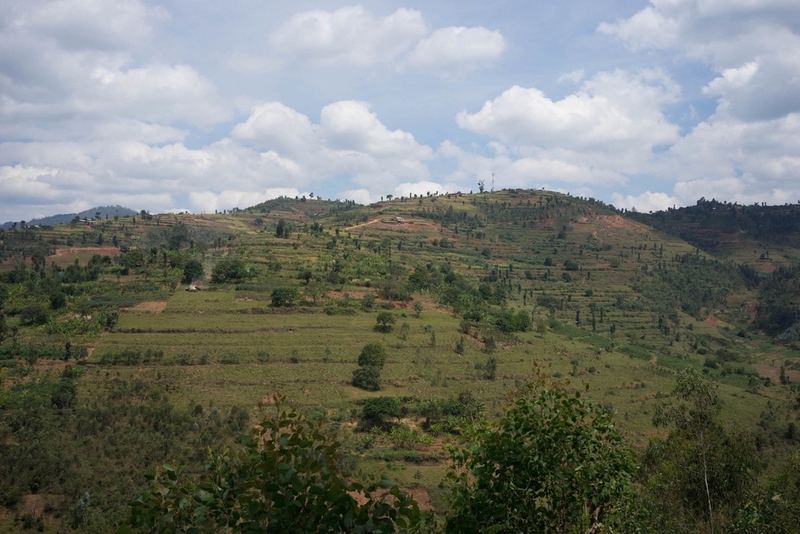 This is the first in a series of blog posts about this particular project in Rwanda. Stay tuned for more!